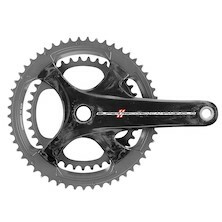 The centre of your bike's drivetrain, the crank set (or chainset) is spins on the bottom bracket bearing; converting pedalling motion into the chain rings' rotary kinetic energy. 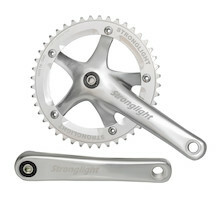 Crank sets are normally comprised of cranks and chain rings, perfectly matched with particular applications in mind. Some come supplied with a dedicated bottom bracket, others require an purchase. 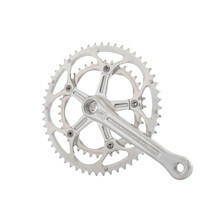 Here at On-One we have single, double and triple MTB, road, track and single speed chainsets; all with various crank lengths, chain ring sizes and BB fitting options. From big names like Shimano, SRAM and FSA; our range covers all the regular bottom bracket standards, from square taper track crank sets, to external bearing cup systems such as Hollowtech, GXP and MegaExo.